The Football Coach Doesn’t Need Much Sleep. Here’s Why. 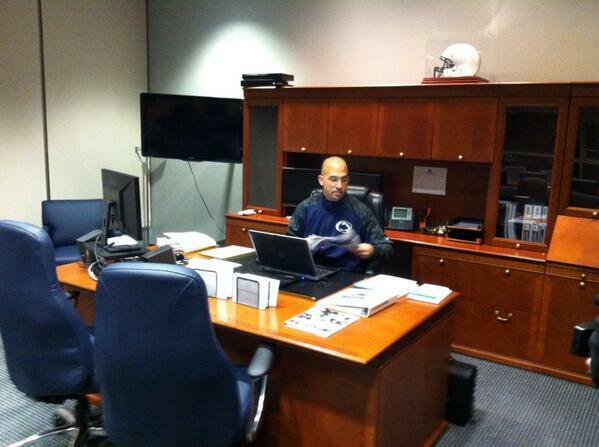 James Franklin, on the job at 5:07 a.m. This caused me to listen closer because I had just put the finishing touches on a feature for our March/April issue—a Q&A with Alan Derickson, professor of labor and employment relations and history, about his new book: Dangerously Sleepy: Overworked Americans and the Cult of Manly Wakefulness. I love the title, and better than that, the topic is really interesting. Derickson traces hundreds of years of American history, looking to explain how sleep deprivation came to be seen as a virtue. Among the culprits: Thomas Edison, Ben Franklin, Charles Lindbergh … and football coaches. Derickson focuses on steelworkers, Pulllman porters, and long-haul truckers to explain, in real terms, the problems of insufficient sleep. Stay tuned for the upcoming Q&A. In the meantime, you can check out this Harvard Business Review piece to get a sense of Derickson’s research. Entry filed under: The Penn Stater Magazine. Tags: Alan Derickson, Harvard Business Review, sleep deprivation.